One more Suburban Council girls basketball team fell from the ranks of the undefeated during action on Friday, Dec. 16. Here’s a look at what transpired. 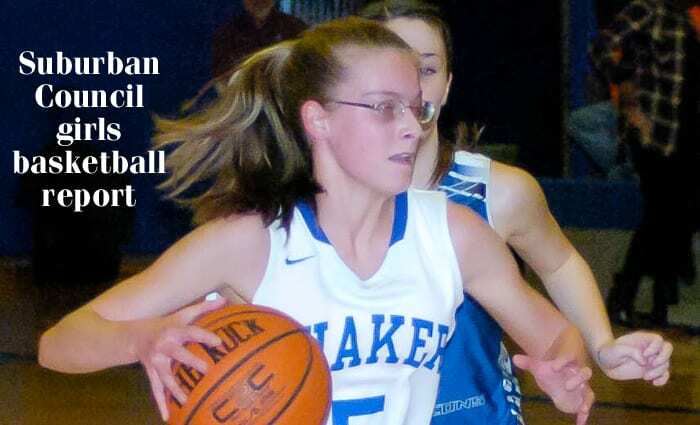 Shaker (4-0) outscored Bethlehem (3-1) 33-21 in the second half to remain undefeated. Sierra “CeCe” Mayo led four Blue Bison players in double figures with 15 points, while the Kirby sisters – Maggie and Molly – each scored 13 points to pace the Lady Eagles, who suffered their first loss of the season. Saratoga’s Dolly Cairns (26 points) and Kerry Flaherty (23 points) proved to be too much for Colonie to handle. Aliyah Wright had 18 points for the Garnet Raiders (1-3). The defending Section 2 Class AA champs dominated at both ends of the floor, as Shen (4-0) remained unbeaten in league play. Cameron Tooley poured in 19 points, and Alex Tudor contributed 16 points for the Plainsmen. Olivia Baumann’s 15 points paced Guilderland (1-3). A 16-4 run in the second quarter broke the game open for Albany (1-2). Imani Harris led a balanced attack for the Falcons, while Jordan Hipwell scored 22 of Ballston Spa’s 37 points. Averill Park (2-2) jumped out to a 28-1 lead in the first quarter and never looked back in beating Schenectady (0-4). Kat Stackrow had 23 points for the Warriors, while NaSeyah Dix netted 14 points for the Patriots. Shalie Frierson’s 15 points helped Troy (3-1) pull away from Mohonasen (1-3). Saeeda Abdul-Aziz scored 14 points for Mohonasen, which trailed 35-10 at halftime. Two of the top players in the Suburban Council squared off in this match-up. Columbia’s Selena Lott, who is headed to Marquette University next year, had 24 points for the Blue Devils (4-0), while Olivia Owens scored 18 points for Niskayuna (1-3).